It may not be the most attractive looking food for those who are unfamiliar with it, but it is among the most delicious ones: a creamy food dip or spread made from chickpeas called hummus. Hummus originates from the Middle East (e.g. read this story by Sari Kamin). You can buy it ready-made in supermarkets but the taste doesn’t come anywhere close to the homemade version. It’s easy to make, so why not do it yourself? 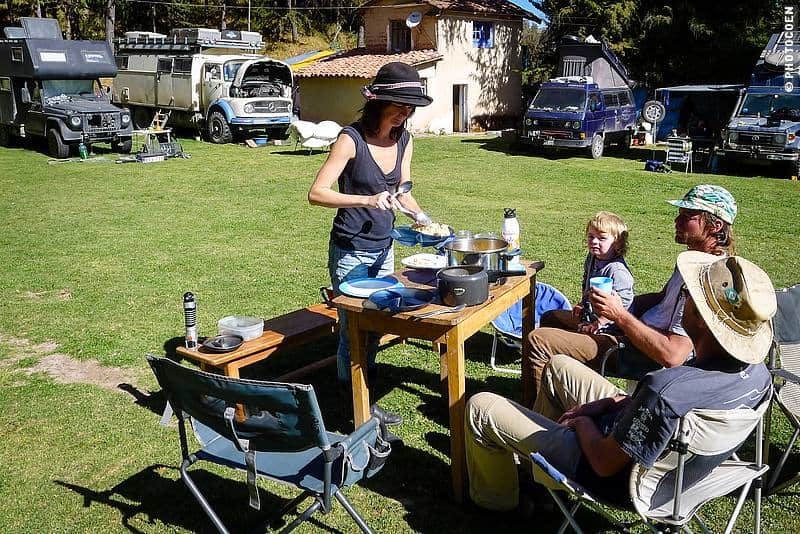 The first time we ate it, we were camped in Cusco (Peru), at the well-known Quintalala Campsite for overlanders. Besides using the campsite as a base to visit Machu Picchu and other famous sites in the area, here we spent time with kindred spirits, sharing travel stories around campfires. 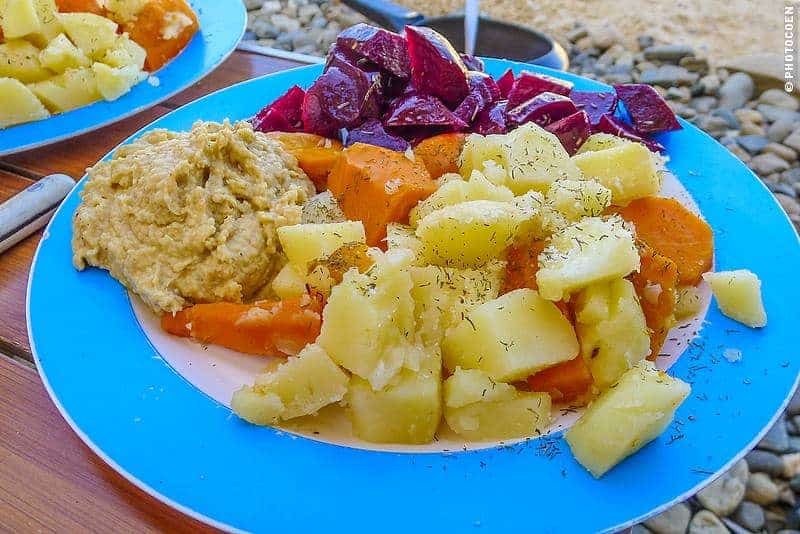 My overlanding friend Emily is a fabulous cook and she introduced us to hummus. It immediately became one of our favorite foods. 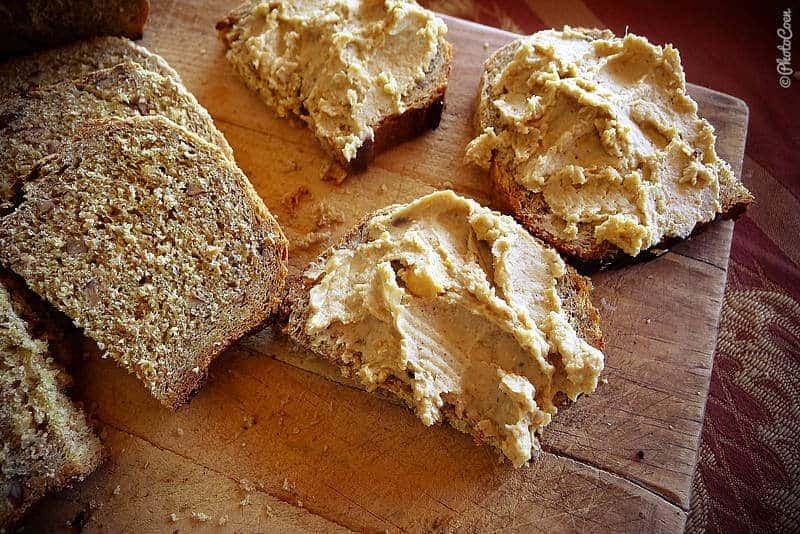 We use it as a food dip for carrots, cucumber or other vegetables, and love it as a spread on our bread. What is the Perfect Recipe for Hummus? For some, hummus is like a sacred food and, we learned, people can vigorously debate about the perfect recipe. Do you need chickpeas or garbanzo beans (apparently they are not the same as sizes differ)? Do you use garlic or not? Do you add tahini or not? Do you add parsley or coriander? Olive oil, anybody? Whether we use chickpeas or garbanzo beans depends on availability. Whichever one it is, I don’t like to use canned beans and will always cook them myself. We love hummus as a snack with our drink in the evening, and then garlic is a great ingredient. But since we mostly eat hummus on our bread in the morning, I leave out the garlic. I recently read about adding baking soda when cooking the chickpeas to make them softer. It’s a trick I haven’t tried yet. I make the hummus soon after I’ve cooked the beans, when still lukewarm. Leaving the cooked chickpeas overnight in the fridge and making hummus the next morning with cold ones simply doesn’t result in anything tasty. It is important to soak the chickpeas overnight. You will see a kind of foam developing on top of it. When you don’t soak beans, this foam causes you to feel bloated or to fart. Soaking and rinsing solve that problem. 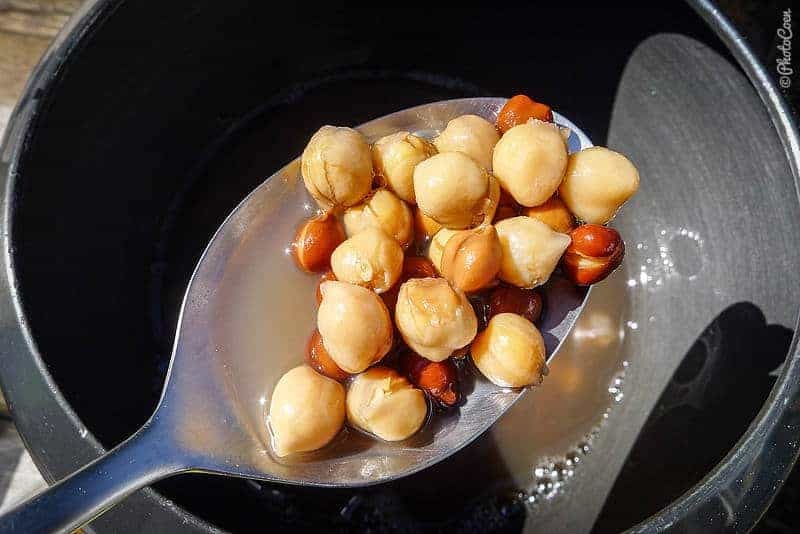 During the soaking, I rinse the chickpeas once or twice, and I thoroughly soak them before cooking. I cook the chickpeas in the pressure cooker with plenty of water. I cook them about 18 minutes (Another advantage of soaking is that you minimize your cooking time a lot.). After 18-20 minutes, I turn off the heat and leave the pan closed until I can open the lit without having to unpressurerize it (pushing the valve to let go of the steam). After cooking, keep the liquid! I have no specific measurements. I just taste and add whatever is needed until I’m happy with the result. About a cup of garbanzo beans/chickpeas. About 2 tablespoons of tahini. When I don’t have tahini I add sesame seeds. It does not give the same result but is a good alternative. Pinch of salt (which I assume is not needed when cooking the chickpeas in baking soda). Squeezed lemon, 1 or 2. When I can’t get them, I’ll use lemon juice. In South America I bought limes. Since our hand blender (more on that below) is not as strong as a food processor I use a trick to prevent it from overheating (I’m not sure if that would happen but I don’t want to take the chance). I start with about half of the chickpeas, a lot of cooking liquid and all other ingredients. Blending this makes it too liquid but I then add the rest of the chickpeas and it will result in the right consistency. Initially I depended on a fork to mash the ingredients. This is more work and doesn’t give you such a smooth spread, but it’s good enough when you don’t have anything else. 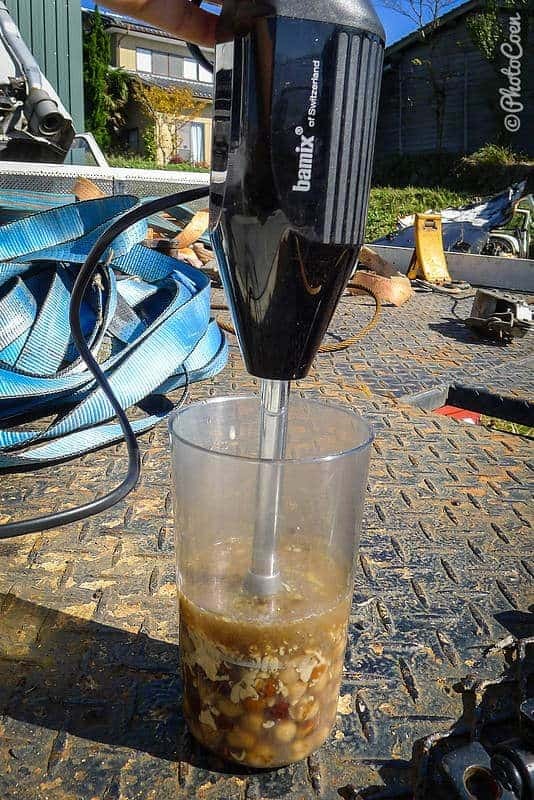 I did that for months before we decided to invest in a good blender, the Bamix hand blender. 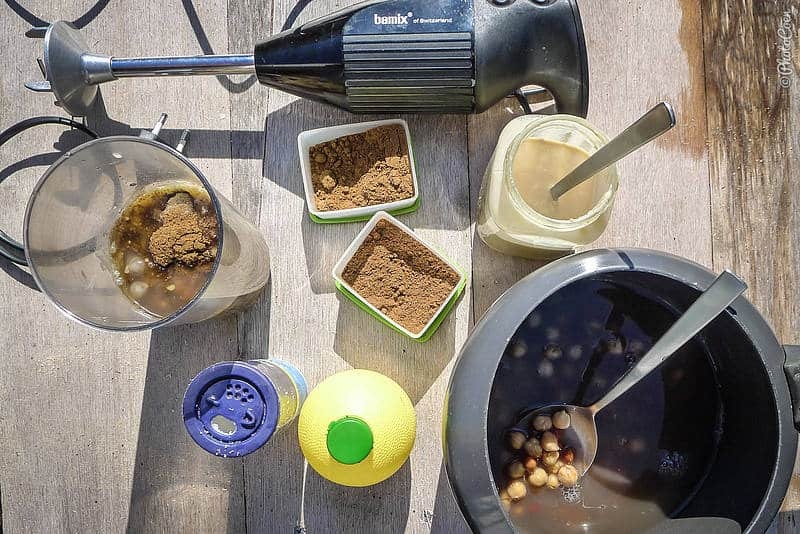 When we bought it, we had low-voltage batteries in the Land Cruiser so we opted for the Bamix blender that uses the least power. The blender works perfectly to blend soups. For hummus I improvise a bit to prevent the blender from overheating (like I explained above). This blender, however, is not strong enough to make a smooth peanut butter or smooth green smoothies. It will stay a bit chunky. It is good enough for us, but if your car has stronger batteries, you may want a hand blender with more power. Join the crowd and receive an occasional email with news, updates and the best bits from the blog. (No spam, rare enough so as not to annoy, and easy to unsubscribe from). Hallo Karin-Marijke, zijn jullie tevreden van de handmixer? Wij denken er ook over ons eentje aan te schaffen voor tijdens onze reizen. Ik zou er ook hummus mee willen maken waar wij ook zo op verzot zijn. Hoi Kathy en Guy, Karin-Marijke is erg tevreden met de Bamix, ze heeft er wel een vleesmes bij gekocht, dat is een zeer klein scherp mesje. Dit vooral ook om vezelrijke groenten echt klein te hakken. Bij nader inzien was een 200 watt mixer misschien beter geweest. Zeker ook om pindakaas zelf te maken. De staaf kan je er niet uit halen. En het beste kun je hem ook verticaal bewaren, zoals per handleiding.